Here we can see two extremes of cero utility: at N=0 where there are no persons and at N=100 where each person lives with 1 resources, at subsistence level. 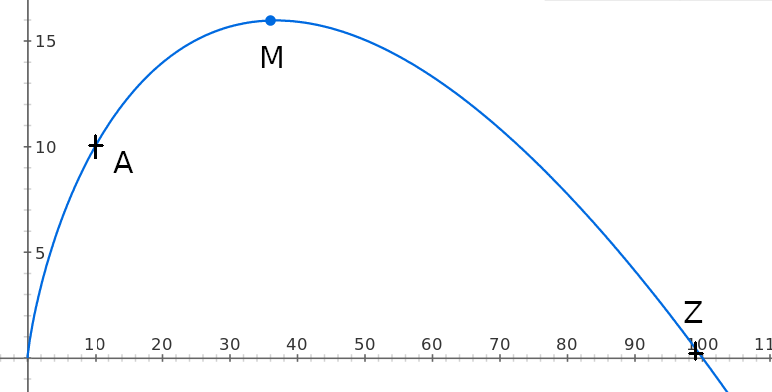 In the middle there is a sweet spot, and the maximum M lies at around 37 people⁵. Now we can answer our question! Population A, where N=10 is better than population Z where N=99, but M is a superior alternative to both. So I have shown that there is a population M greater and better than A where everyone is worse off, how is that different from the RC? Well, the difference is that this does not happen for every population, but only for those where average well being is relatively high. Furthermore, the average individual in M is far above subsistence. In my model I assumed an equal distribution of resources over the population, mainly to simplify the calculations, but also because under the log relationship and if the population is held constant, total utilitarianism endorses equality. I will try to give an intuition for this and then a formal proof. This graph represents individual utility (vertical axis) vs individual resources (horizontal axis). If there are two people, A and B, each having 2.5 and 7.5 resources respectively, we can reallocate resources so that both now are at point M, with 5 each. Note that the increase in utility for A is 3, while the decrease for B is a bit less than 2, so total utility increases by more than 1. 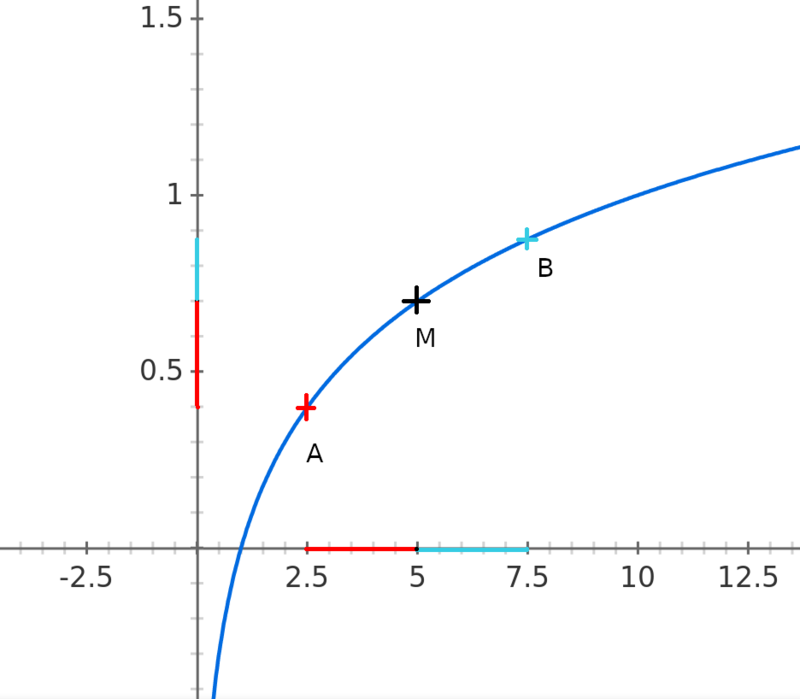 This happens no matter where in the graph are A and B due to the properties of the log function. As long as there is a difference in wealth you can increase total utility by redistributing resources equally. For a formal proof, see ⁶. The main conclusion I get from this is that although total utilitarianism is far from perfect, it might give good results in practice. The Repugnant Conclusion is not dead, however. We can certainly imagine some sentient aliens, AIs or animals whose utility function is such that greater, worse-average-utility populations end up being better. But in this case, should we really call it repugnant? Could our intuition be fine-tuned for thinking about humans, and thus not applicable to those hypothetical beings? I don&apos;t know to what extent have others explored the connection between total utilitarianism and equality, but I was surprised when I realized that the former could imply the latter. Of course, even if total utility is all that matters, it might not be possible to reshuffle it among individuals with complete liberty, which is the case in my model. 1: One might consider other ways of controlling individual utility in a population besides resources (e.g. mind design, torture...) but these seem less relevant to me. 2: Actually, in the original formulation Z is shown to be better than A, not just equally good. 3: As long as utility is well defined, that is. Here I will use self-reported happiness as a proxy for utility. 6: For a population of N individuals the distribution of R resources which maximizes total utility U=Σlogri is that where ri=R/N for all i. The proof goes by induction on N.
Now we have to decide how much should RN be.